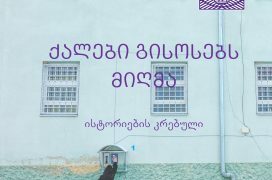 კრებული „ქალები გისოსებს მიღმა“ მოიცავს პატიმარი და ყოფილი პატიმარი ქალების ისტორიებს, სადაც მოთხრობილია ციხეში გატარებული პერიოდის შესახებ, პატიმრობისა და თავისუფლების აღკვეთის იმ ნეგატიურ ფაქტორებზე, რამაც გავლენა მოახდინა მათ მიერ მზრუნველობითი ვალდებულებების შესრულებაზე, კერძოდ შვილებისა და ოჯახის მიმართ და პროფესიულ საქმიანობის თვალსაზრისით. კრებული ასევე მოიცავს ოჯახში ძალადობის მსხვერპლი ქალების ისტორიებს, რამაც განაპირობა მათ მიერ დანაშაულის ჩადენა. ისტორიების კრებული მომზადდა საერთაშორისო ორგანიზაცია „ციხის საერთაშორისო რეფორმის” პროექტის „საქართველოს სისხლის სამართლის სისტემაში გენდერ-სპეციფიკური საჭიროებების ადვოკატირება ქალთა უფლებების გაუმჯობესებისათვის” ფარგლებში, ფონდი „ღია საზოგადოება – საქართველოს” (OSGF) ფინანსური მხარდაჭერით. “Women Behind Bars” is a set of stories told by women prisoners and former prisoners about the years spent in penitentiary establishments and the negative factors their imprisonment had on their caring liabilities towards their families and children. The stories also include cases of those women, whose offences are related to the domestic violence. 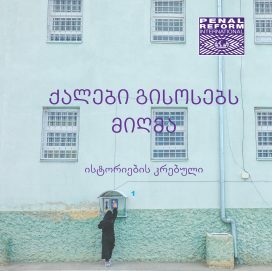 This publication was made possible within the frameworks of the project Promoting women’s gender-specific needs and priorities in the criminal justice system in Georgia funded by the OSGF and implemented by Penal Reform International South Caucasus Office.